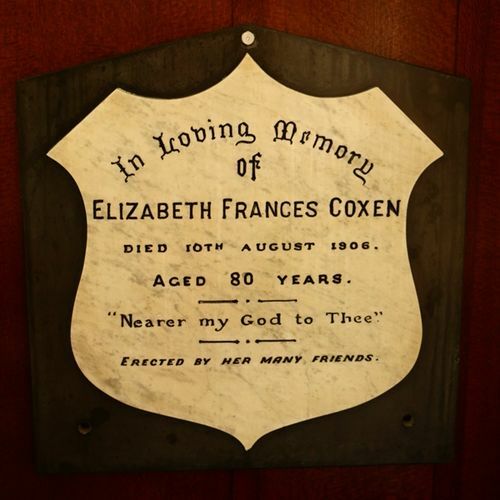 Plaque erected by friends in memory of Elizabeth Coxen who died in 1906. The memorial to Mrs. Charles Coxen, whose death occurred on August 10, 1906, at the age of 80 years, was unveiled last night by the Rev. Walter Thompson, B.A. (St. Michael and All Angels' Church, New Farm), at the service held in the Church of England, Bulimba. There was a large congregation, and the hymn "Nearer, My God, to Thee" was sung while the unveiling ceremony was being performed. An impressive sermon was preached, the preacher stating that they were carrying out God's will, and the underlying principle of it all was that nothing was too good or too precious for the service of our Lord. The deceased lady had been a worshipper whom they had all loved and revered. As a true churchwoman, a true wife, and a true friend she came to be called the " Mother of Bulimba." She was not only loyal to her church, but faithful to her home, and the consecration of the spirit which animated her in early life enabled her to bear up in the midst of her illness. A responsibility rested upon all belonging to the church to see that their parish prospered and did not lack true helpers. Brisbane Courier (Qld), 2 December 1907.